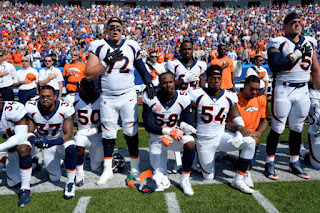 In my latest In Good Faith column, I write about the controversy surrounding NFL players kneeling during the National Anthem and the importance of broadening the definition of patriotism. It was quite a weekend of football here in New England this past week. The Patriots pulled out a victory against a tough Houston Texans team in classic, last-minute Tom Brady fashion. Boston College hung valiantly with national powerhouse Clemson before being overwhelmed in the fourth quarter. Yet for all the action on the field, it was the conversation outside the lines that had the greatest impact. The posture of players during the singing of the National Anthem became more relevant than the final score. Kneeling or standing was subjected to greater analysis than blocking and tackling and the deep divisions within our nation were again exposed. The emotional impact of this latest flashpoint is profound and there are few moderate voices on this issue — just log onto Twitter. The two trending hashtags #TakeAKnee and #StandUp point to just how polarizing this issue has become. 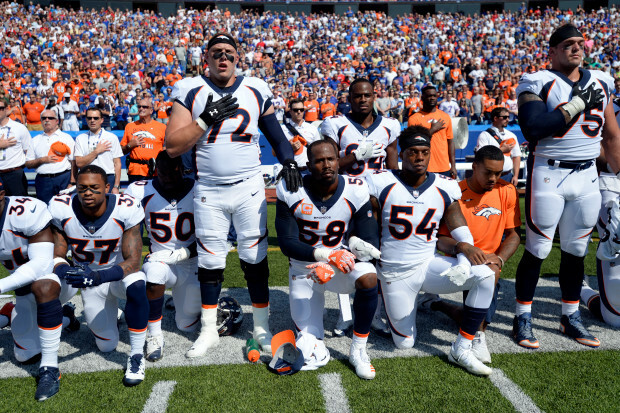 The players who have chosen to kneel during the anthem — predominantly though not exclusively African-American — are either vilified as “whiny, millionaire athletes, disrespecting our nation” or celebrated as “prophetic voices fighting against injustice.” As with many divisive issues, where you stand depends on where you sit. As someone who spends a lot of time both kneeling before an altar and standing behind one, I feel attuned to the rhythm of honor, sacrifice, service, and respect. Yes, as a Christian, my allegiance is ultimately pledged to the cross, but I understand the emotions surrounding loyalty and community. What I don’t understand is how patriotism has somehow become the exclusive domain of the military. This is so often the response from people incensed at players taking a knee during the anthem — that to do so is a direct slap at our country’s soldiers. Serving one’s country through the armed forces is absolutely a patriotic act. I am thankful for those who have served, those who are serving, and those who have lost their lives in defense of this nation. They are indeed patriots. Yet what gets lost in this perspective is forgetting that protest is also a form of patriotism. Rosa Parks sitting down on that bus in Montgomery is as patriotic an act as soldiers storming Osama Bin Laden’s compound in Pakistan. We may not be able to solve the deep divisions in our country overnight but maybe we can work together to broaden the definition of patriotism. I’m convinced that patriotism transcends posture. So while it is patriotic to enlist in the armed forces, it is also patriotic to volunteer at a local food pantry; or have a heartfelt, honest conversation with someone who holds a divergent viewpoint; or donate money to support hurricane relief; or listen to the concerns of those crying out for racial justice. One of the main reasons I served in the Army was to defend everyone’s right to voice their opinion — whether or not I agreed with it. That’s the Constitution I vowed to defend and that’s the America I dream about. What makes America great is our openness to debate and difference — not blind allegiance or a disregard for those who don’t look or think like us. Patriotism, like much of life, is not always so black and white. It’s not just a matter of loving it or leaving it; of standing or kneeling. There are shades of gray in the complex society in which we live and recognizing that patriotism comes in many forms is one way we can authentically honor America. Very well expressed. Thank you. I too have been perplexed by the hatred spewing from people's mouths and keyboards. I think each of us has a right to our opinion, but we also have a responsibility to not attack others for expressing theirs. Jehovah's Witnesses do not salute the flag or recognize the national anthem, and not many people are frothing at the mouth about that. This is just the kind of thoughtful commentary we need so much more of. Thank you. "We may not be able to solve the deep divisions in our country overnight but maybe we can work together to broaden the definition of patriotism." Right on.